ENERGY « Global Market Insights, Inc. Propelled by extensive proliferation of digitization, the structured cabling market is slated to establish itself as an extremely lucrative investment ground in the forthcoming years. A number of legacy facilities are finding it difficult to maintain the order & ease with which a cabling infrastructure can be accessed. However, the extensively used cable management solutions & products in structured cabling can be installed with relative ease & can facilitate modular and simple designs, providing these legacy facilities with an ideal solution for the challenges they face, thereby driving the structured cabling market landscape. Apart from industrial applications, structured cabling is also finding deployment in modern residential & commercial construction projects. One of the latest avenues of growth for the market is the rapidly developing smart building & intelligent lighting industry, fraught with LED lights, integrated with sensors & controls that perform a number of different tasks, ranging from motion sensitive lighting and controlling brightness & color through the smartphone to managing ventilation according to the number of individuals in a room. The increasing adoption of several digital services as well as the growing population of internet users has been augmenting data center demands across the world, which is in turn fueling structured cabling market growth. The world is becoming increasingly more digital & connected – indeed, according to a Cisco Visual Networking Index, the annual IP traffic across the world would be reaching the 3.3 zettabytes (ZB) mark by year 2021 and would be increasing more than threefold over the coming five years, driving extensive demand for data centers. Structured cabling systems are a crucial part of data centers as they facilitate faster data-transfer rates and ensure effective connectivity of the different IT devices in the facility, thus lessening the chances of system failure & downtime, which significantly improve the effectiveness of a business’ decision-making process, helping it maximize its profits. Moreover, increasing high-speed connectivity demands of data center & device convergence would also be responsible for driving the market’s growth. The industry is witnessing an increasing rate of adoption of coaxial & fiber optic cables to quench the high-speed connectivity demands. These cables boast of a significantly greater level of bandwidth & can transfer much larger amounts of data per unit of time in comparison to conventional metal cables, making them a must-have for modern networks and thereby driving structured cabling market further. 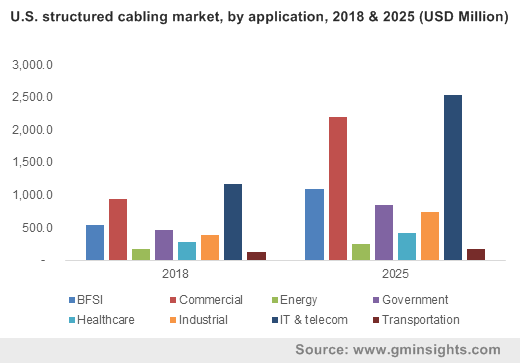 With increasing demand for faster connectivity & higher bandwidth, network designers are of the opinion that the fiber-optic structured cabling segment would be establishing itself as a backbone for the global telecom industry infrastructure. The modern technology-driven world has been changing the operating demands of almost all of the industrial sectors. Moreover, with the rapid evolution of smart devices such as tablets, smartphones & smart watches, that consume voice & data services on a regular basis, the integration of IT & telecommunication is getting rather advanced. This amalgamation is expected to drive more standardization in the two industries during the implementation of advanced technologies & infrastructures that enhance the voice & data services. This has put an increased amount of pressure on telecom companies to facilitate uninterrupted & better services to their customers. The fiber-optic structured cabling solution is being termed an ideal way with which the industry can fulfil its connectivity requirements as they provide an optimal environment that can transmit voice & data at extremely high speeds. Moreover, as data centers are telecom operators’ foundation in present scenario, the upgradation of these facilities to enhance user experience would also be driving the structured cabling industry size from the IT & telecom sector. Furthermore, according to a 2018 report by TeleAnalysis, adapting to changing circumstances, more than 60% of the world’s telecommunication network facilities are projected to become data centers over forthcoming years, enabling the structured cabling market to depict sizable growth from the IT & telecom applications. Owing to the presence of a connectivity-driven foreground, the global structured cabling market would be drawing in significant growth over the years to come. In fact, according to a research report by Global Market Insights, Inc., the overall structured cabling market size would be exceeding a valuation of $25 billion by 2025. This entry was posted in Electronics and Media and tagged BFSI, Cables, Commercial, Communication Outlet System, Consulting, Copper, ENERGY, Fiber Optic, Government, Healthcare, Industrial, Installation & Deployment, IT & Telecom, Maintenance & Support, Patch Cables & Cable Assemblies, Patch Panels & Cross Connects, Racks & Cable Management, Structured Cabling Market, Structured Cabling Market Report, Structured Cabling Market Share, Structured Cabling Market Size, Structured Cabling Market Trends, Transportation, U.S. Structured Cabling Market. 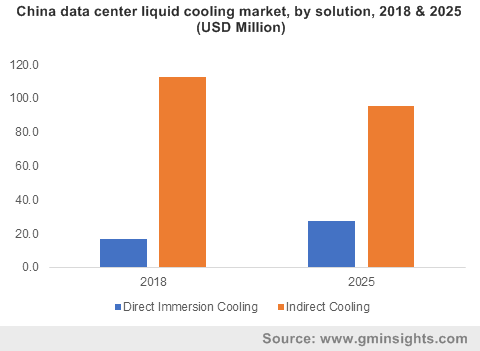 The increasing demand for digital services and unprecedented growth in AI and machine learning has helped push data center liquid cooling market share to new heights lately. Data centers demand efficient cooling systems to reduce power consumption as over 30% of the power is used for cooling purposes. Processor performance is also severely affected by overheating resulting in slower operations. However, with businesses increasingly shifting towards mainframes and supercomputers, liquid cooling technology seems to be an ideal solution for modern data centers. Furthermore, the consistently changing demands for new, uninterrupted digital has been prompting data centers to adopt innovative technologies that will help boost data center liquid cooling market in the coming years. The growing implementation of artificial intelligence (AI), big data, cloud, and machine learning in newly developed software solutions has also been driving the industry growth. With the development of more powerful chips capable of rapidly processing data for new complex applications, the amount of power consumption has exponentially increased leading to more component heat generation. For instance, an increasing number of GPUs and FPGAs are nowadays pushing systems to their limits for smoothly running heavy applications like AI, big data analytics, HPC, media streaming, machine learning which in turn generate high amounts of heat. Reports claim that the heat profile for many GPU based servers is double than that of traditional servers. However, with the benefits of liquid cooling technology businesses can deploy applications at a much higher density with increased efficiency, that will lead to a commendably reduced carbon footprint, supplementing the data center liquid cooling industry growth in the upcoming years. One of the most extensively used solutions for data center cooling is the direct immersion cooling solution. Also known as liquid submersion cooling, this solution is used to submerge full servers in a thermally conductive liquid to offer enhanced temperature control. The method is slowly gaining popularity with innovative datacenters across the world. Some ultra-high-speed supercomputers like IBM’s Summit supercomputer already use liquid cooling technology to pump around 4,000 gallons of water per minute through its system. Direct immersion can significantly cool solid-state drives, which makes the entire process more efficient in comparison with traditional methods. The technology also reduces system humidity & heating effect, further offering high operational performance and speed. Additionally, solution developers offer efficient maintenance & installation services to data center clients which further supports industry expansion. Indeed, it comes as no surprise that the data center liquid cooling industry will gain substantial momentum from the robust adoption of direct immersion cooling solutions. The increased focus on business agility and cost optimization has led to the rise and growth of cloud data centers which in turn has given birth to the trend of hyper scaling. Hyperscale cloud operators are increasingly offering better resources and bandwidth that support the growing demand for storing large chunks of data on the cloud. Compared to traditional models, hyperscale data centers require to operate in colder zones as these facilities constantly handle increasingly large amount data traffic, which expands IP connections and fulfills high storage demands, factors that make it essential for deploying servers with high-density cooling elements like liquid coolers and water-chilled metal boxes equipped with blowers to enable fast operation at ambient temperatures. The growing shift towards hyper scale cloud data centers will thus augment the growth of data center liquid cooling industry. Speaking of the regional expanse of the data center liquid cooling market, it would be prudent to state that APAC and Europe are two prominent geographical revenue pockets for the industry. 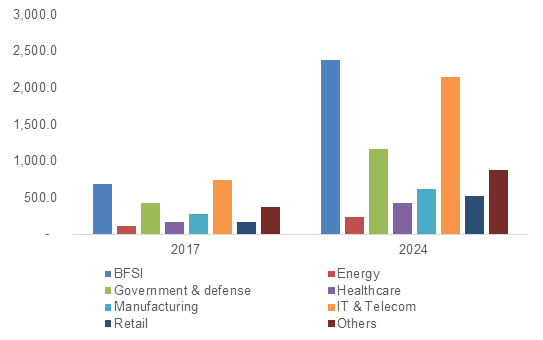 Asia Pacific data center liquid cooling market will witness significant growth over the ensuing years, driven by the increase in data capabilities brought forth by the growing digitalization in every possible industry sector. The expansion of the Europe data center liquid cooling market can be majorly credited to the massive presence of numerous colocation facilities across the continent. Powered by the advent of robust digitization across the industries such as BFSI and medical care, in tandem with the rapid adoption of machine learning technology in the region, Europe data center liquid cooling industry share is set to soar high in the years to come. Liquid-based cooling solutions have more heat removal capabilities & can reduce a data center’s power consumption by about 70%. The paradigm shift toward high energy consuming applications and the deployment of AI, big data and machine learning will mandate the adoption of liquid cooling solutions for smoother operations in the years ahead. Reports from Global Market Insights, Inc. cite that the data center liquid cooling market size will exceed the $2.5 billion mark by 2025. This entry was posted in Electronics and Media and tagged BFSI, Colocation, Consulting, Data Center Liquid Cooling Market, Data Center Liquid Cooling Market Size, Direct Immersion Cooling, ENERGY, Global Data Center Liquid Cooling Market, Government, Healthcare, Indirect Cooling, Installation & Deployment, IT & Telecom, Large Data Center, Maintenance & Support, Manufacturing, Rack Based Cooling, Row Based Cooling, Single Phase Cooling, Small and Mid-Sized Data Center, Two Phase Cooling. Increased deployment of edge computing and the need for having a greater control on data has enhanced the edge data center market penetration across numerous industry verticals worldwide. Establishing a data center close to the source of information allows for a faster access and real-time analysis of data, complemented with reduced network traffic and lower cost for operating and maintaining the infrastructure. The edge data center industry has enabled organizations and cloud-based service providers to reach smaller cities, locations where large data centers do not have a presence but represent considerable data generation. Continuous growth of the IT and telecommunications, healthcare, banking and energy segments have gradually propelled the edge data center market revenue over the last few years. These sectors generate enormous amounts of information which are used by enterprise customers and businesses to enhance consumer experience. Growing popularity of online streaming services has also benefited the edge data center industry, as caching web application or content on servers nearer to the market allows for high-quality and high-bandwidth services. Companies like 365 Data Centers and EdgeConneX have tapped into these opportunities and expanded their edge data centers around the globe. Elaborating further, EdgeConneX had earlier in the year announced its plans to add up to 50 MW capacity in North America, cover tier-2 cities like Atlanta, Phoenix, Denver, among others, and had already opened its second center in Atlanta by August. It later unveiled an edge data center in Toronto as well, bringing its total number to 40 such centers spread over North America, South America and Europe, becoming a key player in the edge data center market. More recently, it had confirmed the acquisition of an edge data center in Warsaw, Poland, encouraged by the nation’s rising adoption of cloud, favorable data regulations and ease of access for nearby countries. Widespread expansion activities undertaken by the company is representative of the overall edge data center industry trends, driven by the unparalleled rate of development in the telecommunications sector. The growth of IoT and the increasing number of connected devices globally has created a need for communicating captured valuable data quicker. It is projected that by 2022, the number of connected devices in the world will reach 29 billion, indicating the massive amount of data that will be gathered, inadvertently strengthening the edge data center market. The propagation of 4G LTE networks has allowed consumers to access and use various online services, with LTE downloads averaging around 19.4 Mbps in the U.S. over the last quarter of 2017. Fast developing economies have also witnessed an accelerated growth rate in terms of IoT and data usage, with average 4G consumption in India reported to be around 11 GB per month in December 2017. Telecom firms are leaning more towards edge computing to gain the ability to store immense data accumulated from devices and direct it straight to a central center or cloud platform, minimizing the backhaul traffic. Additional reports have indicated that by 2021, global mobile data traffic will reach nearly 49 exabytes per month, which would be a seven-fold increase from 2016 figures. 5G, the latest generation of communication networks, is expected to grow steadily over the period and can become the key network utilized for most applications over the following years. Experts insist that without edge computing, 5G will not be able to meet its intended goals of very low latency and colossal broadband services. Subsequently, as the implementation of 5G proceeds steadily throughout the world, fulfilling the network’s huge potential will necessitate the advancement of the edge data center market. 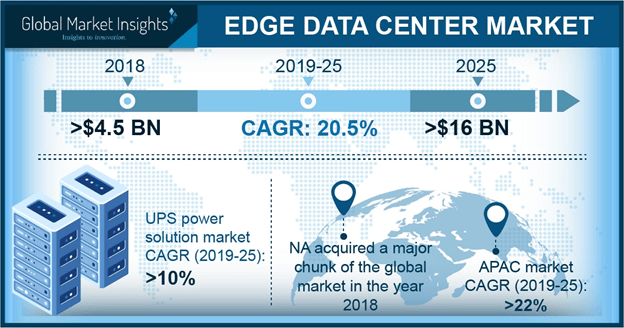 All in all, the rising network consumption in the telecommunications industry consumers and the augmented utilization of edge computing in other sectors will fuel the global edge data center market, with its valuation estimated to cross USD 13 billion by 2024. Fast-growing companies like Anixter, Cisco Systems, Dell, EdgeConneX, 365 Data Centers, Panduit Corp, Schneider Electric, and many others offer the required edge data center infrastructure, equipment and third party services. This entry was posted in Electronics and Media and tagged BFSI, Colocation, Consulting, Cooling, DCIM, Edge Data Center Market, Edge Data Center Market Forecast, Edge Data Center Market Growth, Edge Data Center Market Report, Edge Data Center Market Size, Edge Data Center Market Trends, ENERGY, Global Edge Data Center Market, Government, Healthcare, Installation & Integration, IT & Telecom, IT Racks & Enclosures, Managed, Manufacturing, Networking Equipment, Power, Service, Solution, UPS. Over the recent years, the global data center colocation market has been witnessing remarkable pace of growth owing to the increasing complexity of managing humongous data centers and the shortcomings with regards to power and space. In addition to this, the emergence of the Internet of Things along with the rapid proliferation of big data and cloud technologies has compelled several business verticals to focus on planning the physical infrastructure of IT-based services. Moreover, large enterprises and SMEs are increasingly shifting to colocation hosting as building a new facility requires a large amount of initial investment, thereby boosting the revenue scale of data center colocation industry. Elaborating further, the process of hosting an onsite facility needs skilled professionals to safeguard the data center from cyberattacks, which is the most pervasive threat. To tackle all these challenges, several data center colocation service providers are combining innovative solutions in their facilities to offer modern enterprises with secure infrastructure at the very initial stage of colocation. In this context, it would be imperative to take note of Cyxtera Technologies which has recently integrated AppGate SDP, a new software-defined perimeter solution, with its high-performing data centers to apply the principle of least-privileged access to the network, which lowers the possibility of a cyberattack. Phasing out obsolete security approaches, the new solution gives fine-grained access to ensure that individuals only connect to the network resources. Needless to mention, the introduction of such unique solutions is proving to be beneficial for the overall data center colocation industry. Highly specialized colocation service provider Colt Data Centre Services (Colt DCS) is set to begin the construction of a hyperscale data center campus in Mumbai, the financial capital of India. With a power capacity of nearly 100MW, the facility is anticipated to become operational in the second half of 2020. In this regard, it would be prudent to mention that Colt DCS is the first major western data center operator to foray in India data center colocation market, which is presently served by small-scale local service providers. Tech giant Facebook had recently announced that it would construct its first purpose-built data center in Asia. The new multi-story facility would be the largest single data center in Singapore and will offer 170,000 square meters of space. Owing to the ease of fiber connectivity and presence of highly-skilled professionals, numerous tech companies have been choosing Singapore as their regional hubs for data center colocation, propelling the commercialization potential of the APAC data center colocation industry. In December 2018, the U.S.-based multinational data center company Equinix announced that it would build a new International Business Exchange data center in Helsinki, Finland. Reportedly, the new data center is slated to enable improved colocation and interconnection capabilities for businesses undertaking digital transformations. For the record, Equinix is a renowned name in the data colocation market given that it operates Platform Equinix, the name of its global data center network made up of 200 data center facilities spread across 52 nations. Driven by a widespread application segment which includes retail, IT & telecom, manufacturing, healthcare, government & defense, energy, and BFSI, the data center colocation market is set to garner commendable proceeds from various geographies in the upcoming years. Additionally, the drastically changing technology trends and the favorable impact of big data, IoT, and AI on cloud infrastructure would further open up new opportunities for the companies partaking in the data center colocation industry, which is slated to surpass USD 90 billion by 2024. This entry was posted in Electronics and Media and tagged BFSI, Data Center Colocation Market, Data Center Colocation Market in Europe, Data Center Colocation Market Segments, Data Center Colocation Market Share, Data Center Colocation Market Size, Data Center Colocation Market Trends, ENERGY, Global Data Center Colocation Market, Government & defense, Healthcare, IT & Telecom, Large Enterprises, Manufacturing, Retail, Retail Colocation, SMEs, Wholesale Colocation. The increasing importance imparted to network stability & wireless communication to speed up network capability has been stimulating private LTE market share. Nowadays, private LTE is used extensively for numerous beneficial purposes such as real-time monitoring, geo positioning activities, in the mobile devices, energy utilities, telecommunication applications, and automotive equipment. The rapid acceptance of long-term evolution (LTE) for high-speed wireless communication across numerous industrial sectors has been encouraging companies in private LTE market to adopt LTE network connectivity. Over the last few years, most of the mobile network providers have shifted to LTE services from 2G and 3G coverage to improve existing communications. The surging digitalization and modernized mobile services have also substantially enhanced data services. Recently in India, the nation’s largest telecom company, Airtel has decided to switch to LTE network services to boost data speed. This move will turn out to be rather beneficial for Airtel as it already has a widespread, far-reaching network coverage. The shifting focus of telecom service providers to LTE to phase out older networks is slated to fuel private LTE industry share. Taking into account the network benefits of high-speed data services, most of the energy companies have been signing deals with wireless network providers that will have a positive influence on the product demand. For instance, a month before, the Brazilian power distributor, Elektro collaborated with Nokia for deploying a private LTE network in its City of Atibaia based electric grid. The deployment of LTE services is slated to help improve the efficiency and reliability of the electric grid that has been serving approximately more than 75,000 business and homes. Through this network, it is also possible to operate smart meters, grid equipment, substation and distributed energy generation sources. Such strategic deals will help players in the private LTE market strengthen their customer base and diversify the traditional telecommunication practices. The surging adoption of digital technologies such as IoT and machine learning will thus further propel the use of private LTE service in the energy sector. 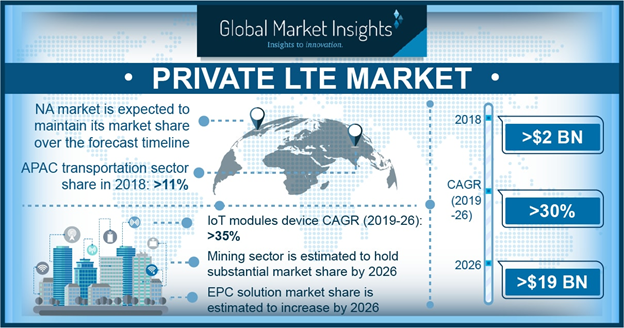 For the record, as per estimates of Global Market Insights, Inc., private LTE market from energy applications is slated to depict a commendable CAGR over 2018-2024. In order to achieve a dominant stance in the market, telecom firm Nokia has also lately been adopting myriad business tactics. Recently, it has collaborated with China Unicom to deploy a private LTE network at BMW Brilliance Automotive Ltd plant based in the Liaoning province. With the use of private LTE connectivity, BMW can carry out smart manufacturing activities and ensure communication for critical applications including video surveillance, object tracking, and analytics at the plant. The integration of private LTE network in the enterprises to secure data and voice communication, wireless video communication, ensure indoor investigation, and inspect the production line maintenance is slated to fuel the product demand over the years ahead. Heavy investments to develop digitalized, modern factories with a secured and transparent work culture will further propel private LTE market share considerably. The emergence of LTE connectivity has also turned out to be rather useful for maintaining peace across the globe. That is to say, the UN (United Nations) has been working continuously to resolve the several global issues for which it has been using LTE network for providing critical communication capabilities. Peacekeeping troops are able to effectively use this LTE network for secure, stable, and future-proof broadband services while operating through the tough geographic terrain. Currently, UN is working on fourteen peacekeeping operations across the globe and it is planning to establish high-speed LTE networks by 2019 to accelerate the communication throughout the missions. Substantive use of LTE connectivity for ensuring digital and standardized work output in the industrial as well as the defense sectors is likely to propel the product demand over the years ahead. On-going changes in the telecommunication technologies to enhance the network connectivity will further stimulate the industry trends. 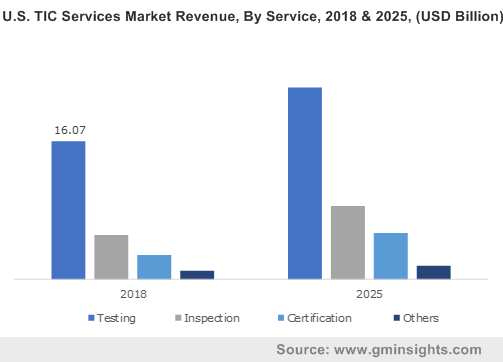 As per estimates, with the surging acceptance for network connectivity across various application sectors, private LTE market is poised to surpass a revenue collection of USD 11 billion by the end of 2024. This entry was posted in Electronics and Media and tagged Backhaul, Defense, ENERGY, eNodeB, EPC, Evolved Packet Core, Handheld Terminals, Infrastructure, Integration & Maintenance, IoT Modules, Managed Service, Manufacturing, MINING, Private LTE Market, Private LTE Market Forecast, Private LTE Market Opportunity, Private LTE Market Research, Private LTE Market Size, Private LTE Network, Public Safety, Smartphones, Training & Consulting, Transport, Vehicular Routers. 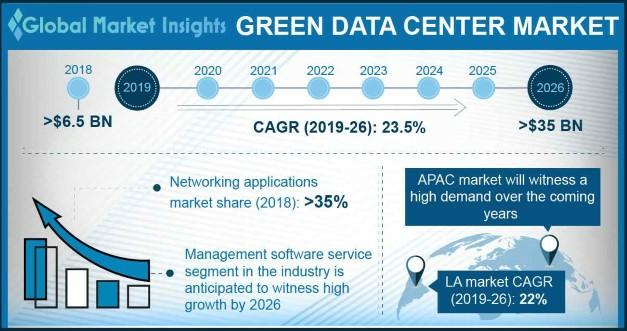 Green data center market is gaining immense popularity lately with the rise in concerns about the increasing energy costs impacting operational and economic efficiency. Most companies are presently implementing strategies to improve cooling and power infrastructure which is one of the vital factors influencing organizational performance, reliability, and serviceability. The shifting trends toward the deployment of green data centers for storing, managing, and distributing information have helped many software companies reduce energy consumption as well as the total energy cost. In fact, energy conscious companies are heavily investing in development of these centers for regaining cooling and power capacities, thereby providing impetus to green data center industry share. Though expensive, considering the long-term benefits of this technology, numerous companies ranging from internet giants to automotive biggies and manufacturing firms to software companies have been involved in green data center infrastructure development. The paragraphs below succinctly elaborate the contribution of myriad companies propelling efficient data center industry share. In 2018, the leading industry behemoth, Siemens signed a deal with the Irish renewable energy contributor, CES Energy for providing on-site electrical generation services for data centers of various technology multinationals located in Ireland. This on-site energy generation is touted to be rather beneficial for data centers in terms of reducing carbon footprints and energy costs, in addition to helping them meet their data center timeframes with the supply of reliable power. The incidence validates that the availability of renewable energy facilities ensuring on-site generation assistance for achieving emission targets will prove to be a key factor reducing the carbon emissions across Ireland, strengthening green data center market trends. Ireland seems to be an ideal location for the establishment of data centers pertaining to climatic conditions, on the grounds of which green data center industry players have been focusing on facility expansion across the nation. Taking into account the shifting focus of technology companies, the regional government is striving to establish Ireland as the European data capital. A few months earlier, the renowned e-commerce contributor, Amazon received approval from the Ireland government to construct a new data center facility in Dublin. The government provided land of 223,000 square feet for the center and an investment of EUR 200 million, with the help of which Amazon plans to establish seven data centers. The implementation of high-profile projects such as the aforementioned is certain to propel Ireland effective data center market. Presently, many tech giants are looking forward to investing in data center infrastructure development across well-established industrial parks. Through this business expansion strategy, these companies plan to facilitate most of the energy so generated for enhancing operational efficiency. Validating the aforementioned fact, recently, social media giant, Facebook made it to the headlines for planning to invest USD 750 million to develop a data center facility in Huntsville based in Alabama after receiving approval from the local officials. In order to supply power to this facility, Facebook plans to use 100% energy from renewables. The company’s strategy is certain to help Alabama achieve economy benefits, as it is touted to receive about USD 300 million in new tax revenue from Facebook’s future data center over the coming 30 years. It is thus overt that massive investments in renewable data center facilities are likely to impel green data center market size across several geographies. In addition to already established behemoths like Google and Facebook, many start-up companies are also entering green data center market. For instance, the U.S.-Norwegian start-up company, Kolos is planning to build the world’s largest data center in Northern Norway that will apparently use local hydropower and chilled air for minimizing energy costs. In order to develop this 600,000 sq/m, four-storey green data center building, Kolos has raised funds from the U.S. investment bank and several Norwegian investors. The start-up company declared that this project will be one of the world’s largest green data center as this plant will receive all the required energy from wind and hydropower, which will reduce energy costs by 60% and provide cost-effective benefits to customers. The increasing awareness regarding green energy among the regulatory bodies of various topographies is certainly a pivotal factor driving green data center market share. In fact, most of the European countries have already implemented strict regulatory norms to encourage the adoption of renewable energy facilities. In this regard, myriad technology contributors have also started deploying renewable energy powered data centers, which has considerably pushed product demand. The continuous investments in facility expansions for achieving higher working efficiency with the reduction of overall operational cost is likely to boost green data center industry share. For the record, by the end of 2024, green data center market will collect a revenue of USD 25 billion. This entry was posted in Electronics and Media and tagged BFSI, Colocation, Component, Consulting, Cooling, Effective Data Centers, Efficient Data Centers, ENERGY, Global Green Data Center Market, Government, Green Data Center Market, Green Data Center Market Forecast, Green Data Center Market Size, Green Data Center Market Trends, Healthcare, Installation, Integration, IT, Managed, Management Software, Manufacturing, Networking, Power, Service, Solution, Telecom.